Isabelle (right) receives the Best Presenter Award on stage after wowing judges with her public speaking skills at the ICAEW South East Asia Business Challenge 2018 in Jakarta. 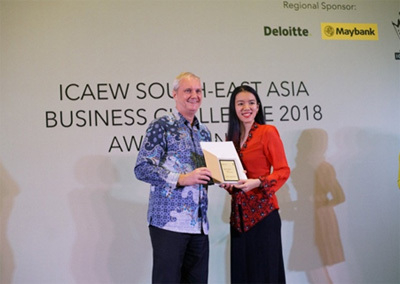 With no expectation of returning to Malaysia with a prize, one can only imagine the surprise on Isabelle Pong Wen-Xin's face after she bagged the Best Presenter Award at the prestigious Institute of Chartered Accountants in England and Wales ('ICAEW') South East Asia Business Challenge 2018 competition held in Jakarta, Indonesia on 17 May 2018. A Bachelor of Commerce (Hons) student, Isabelle was part of the six-member TAR UC team representing Malaysia where they faced teams from Singapore, Myanmar, Vietnam, Thailand and Indonesia in the annual competition organised by ICAEW. The competition served as a platform for undergraduates to sharpen their understanding and practical skills in business and finance, as well as the opportunity to meet and learn from some of the most influential employers like Deloitte and Maybank. Speaking about her experience in this competition, Isabelle highlighted how challenging it was for her and her teammates in terms of managing their time. "We were essentially racing against time right from the preparation all the way to the presentation of our case study. Time management was very crucial. So we split our tasks by taking advantage of each other's strengths and ensuring that everyone contributed equally." On her Best Presenter award, Isabelle confessed it was quite an unexpected achievement. 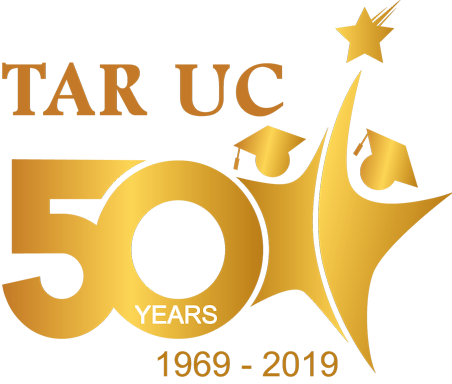 "But at TAR UC, I was given so many opportunities to speak publicly in classes and competitions since my Diploma days. So that experience could have helped me in this competition. "This achievement also comes to show that TAR UC is a pretty great place to study after all! If we truly put our mind to it, we can prove that TAR UC students are just as brilliant as students from any other institutions out there," she proudly added.